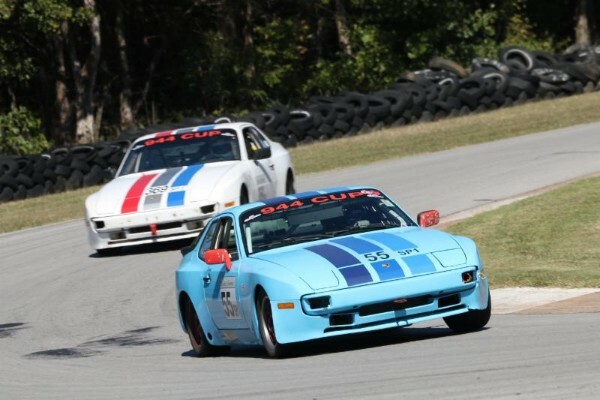 Ryan and Stacie Virden – a husband and wife PCA Club Racing duo – race in the SP1 class in their 944 Cup cars against each other. Stacie even raced just eight weeks after giving birth to the couples’ son. Now that’s dedication! Ryan: I longed for a Porsche 911 for most of my adult life. I got The Magazine About Porsche – Excellence for years and knew that track events existed. After my wife talked me into getting a Boxster in 2004, I asked if I could take it to a Driver’s Education event. That was it – we were addicted. She did not even drive at that event. On the way out of Texas World Speedway, Stacie told me, “You are never driving my car again at the track. You have to get your own car!” She was driving next time. We flew to Memphis, Tennessee within three weeks to pick up our first 944. The Texas regions of PCA really do know how to hold a track event. Stacie: I wanted to drive at the track! Anyone in my family will tell you I wanted to be a racecar driver when I grew up. My dad raced dirt track cars while I was growing up and I went to many of those races. Ryan: On my rookie race weekend at Hallett Motor Racing Circuit, I passed Stacie somewhat in the grass at the start. That was a bit hard to explain. Stacie: I got my race license a couple of years earlier than Ryan because we were trying to stick with one race car. I got pregnant after my first race, and I was worried I might have to give up racing. Ryan delivered me to the hospital in our 911. In the delivery room, I was yelling at the doctor, “No C-section! I have to race in 8 weeks!” It took 15 hours, but I was not going to miss that next race at TWS. Ryan had to go home during the labor to unload the racecar and trailer from our SUV, so that we could take our son home in a car seat. He had our car at Eagle’s Canyon Raceway that morning after picking it up from having a lot of work done. He was shaking it out for my first race after giving birth. That is dedication. Ryan: We traded our perfectly good 11-month-old Boxster in for the 993 when we found it. It was Stacie’s daily driver up until we could not get the infant car seat in it. Ryan: Most guys at the track really wish their wife was into driving. It is great – I admit it, but you do have to be careful what you wish for. Neither of us tell each other “no” on budgets. Two cars can quickly get out of hand which is why we are both in SP1. Everything is times two! But, I wouldn’t change it for anything. Now, the real problem is our 5-year-old son is asking when he gets a race car!